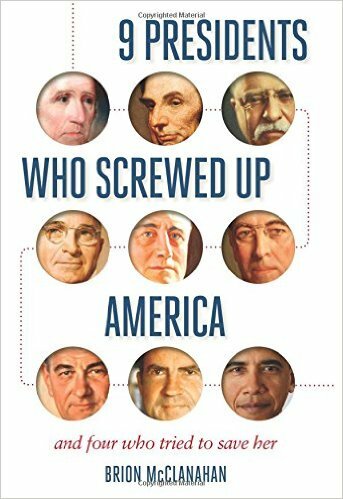 "Brion McClanahan presents a masterful and superbly-scholarly discussion of how nine presidents, beginning with George Washington himself, effectively destroyed constitutional government." Americans seem to have resigned ourselves to the exact form of government that the framers and ratifiers of our Constitution feared most: the tyranny of an elected monarch. The executive branch of the U.S. federal government has grown so far beyond the bounds set for it in our Constitution that Americans can no longer claim to govern ourselves. We only get the chance to pick the man who will spend four years legislating unilaterally with his pen, waging undeclared wars, and usurping still more powers that the people and the states never delegated to the federal government in the first place. When a presidential candidate gets on TV or in a debate and says “elect me and I’ll lower taxes”, “fix education” or “reform healthcare”, most American voters overlook the fact that the office of President has no power delegated to it allowing the office holder to do any of these things. The President’s role as “chief executive” is to “execute” the laws passed by the legislative branch (congress), and to defend the constitution by vetoing laws that congress passes which are not constitutional. But over time the perception has become that somehow the president is in fact the “King” whose will the congress must bow to, and from whose hands alone “change” can come. As a result of this, many on the right today think “Obama has destroyed the country” while those on the left believe “its all Bush's fault.” There’s truth and error within both positions, but looking at the subject contextually, the fact is that those two Presidents, and others, were able to wield power as a result of the “precedents” set by their predecessors- not as a result of the existence of any constitutional authority allowing them to do the things they’ve done. Said another way, contrary to popular belief, we did not just awaken one day and find ourselves in the mess we’re in. Rather, the proverbial snowball has been accumulating speed, size and potential destructive capacity for several generations. If Americans could be provided the evidence needed to glean this reality, then, and only then, can real “change” be brought forward and applied to our system of governance. Brion McClanahan’s book “9 Presidents Who Screwed Up America, and Four Who Tried to Save Her” will walk readers through the process by which the powers of the office of President have been expanded far beyond anything even opponents of the constitution could have imagined. Using “originalism” with regard to the intent of the framers and ratifiers of the constitution, McClanahan expertly shows not only that the presidency has become imperialistic over time, but he provides the pertinent documentary information from primary source materials to prove his assertions. Readers of this important tome will come not only to see that presidential actions are no longer held in check by the constitution, but they will learn important and relevant facts concerning why these “checks and balances” were put into place to begin with. The end result is a thorough understanding of how and why usurpation of non-delegated powers works to erode liberty. This book is not designed to libel or slander past Presidents. Rather, it offers a look at the office of President from a constitutional standpoint, and judges their actions, both good and bad, on that basis and from the viewpoint of a real expert on the subject. There are no punches pulled and no sacred cows. Just the facts delivered with erudite analysis. This will be another in my collection of books that I will refer back to over and again.